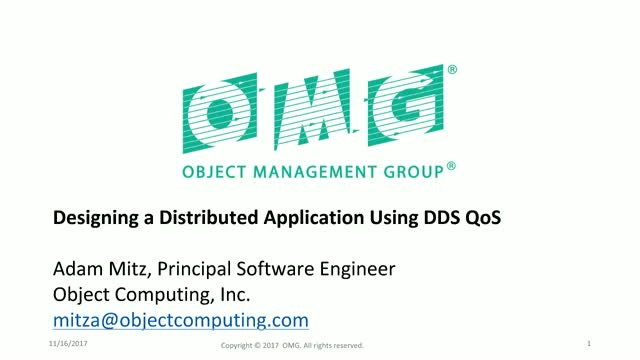 DDS Technical Overview Series - Part IV: The OMG Data Distribution Service provides a diverse set of Quality of Service policies. Strategic use of these QoS policies enables intelligent behavior in middleware and allows the application developer to focus on the domain. In this webinar, we examine one application in detail and explore how it uses DDS QoS policies to address several non-functional requirements. We'll also cover the trade-offs involved in different design choices involving DDS QoS and other DDS features. This webinar builds on the Part I and Part II webinars by examining certain QoS policies in more depth and taking a deep dive into a single application as it evolves from simple data transfer to taking full advantage of the Data-Centric Publish/Subscribe model of DDS. Larry Johnson, OMG Vice President; Adam Mitz, Principal Software Engineer at Object Computing, Inc. Presented by: Larry Johnson, OMG Vice President; Adam Mitz, Principal Software Engineer at Object Computing, Inc.